We have witnessed many times that when neighbours get to know each other, they create necessary conditions for healthier, safer, richer, more inclusive and more exciting lives for everyone. Festival of Neighbourhoods Blitzes give a boost of positive energy to areas of our city that do not have neighbours regularly coming together. We first get to know the neighbourhood and the neighbours to be able to plan for a simple, quick and unobtrusive get together. Before the gathering, we knock on all the doors and start the neighbours thinking about their connections to the people who live close by. At the same time, we invite them to come out and meet other neighbours. At the gathering, we open up a space where neighbours can interact, talk, play and often, make long lasting connections! The most successful gatherings are those where our team can step back and see the magic of neighbours connecting on their own take over! After two explorations of a Kitchener townhouse complex neighbourhood which included many doorstep chats with residents, we found that about a dozen of the families living in these townhouses had been refugees from Syria who moved in over the past year. Through our conversations, we found that despite some interaction and friendship with the “Canadian” group of residents who had lived in the neighbourhood for longer, neither group of people had been able to foster much of a connection with each other, despite some desire expressed by both groups to be able to have more conversations. So we wanted to create an opportunity for all residents of this townhouse complex to come together to learn about each other’s diverse culture and way of living, which we hoped would be a catalyst for regular conversation and care for each other in day-to-day life. To try to achieve this we decided to hold a “neighbourhood blitz” in a nearby park. 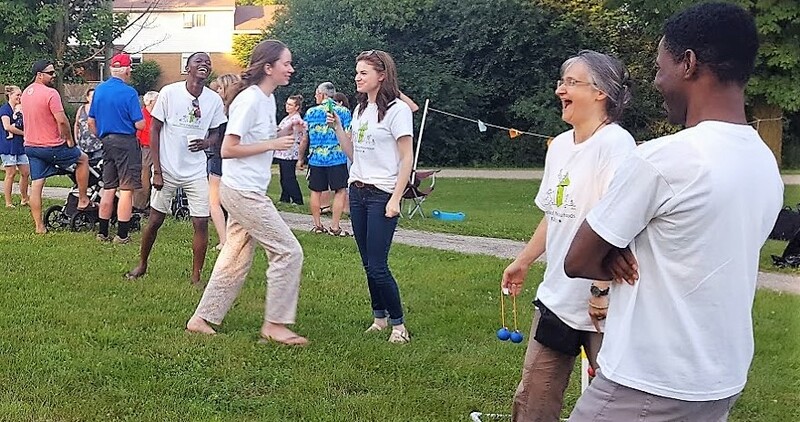 After knocking on doors and handing out invitations the night before, we held a games and crafts night in a nearby neighbourhood park for an hour and a half on Thursday, July 12. Coffee and dates were available for the adults and kids enjoyed freezies! There were all sorts of games and toys available for kids to play, ranging from hula hoops and bubble blowers to soccer, and tug-of-war. For crafts we had Sonia Nadeau from ArtShine to guide people in using their artistic abilities to make cards for one another. We also had another special guest at the gathering named Shiv Talwar who worked with people on the practice of deep breathing using an interactive computer game. He explained to those who participated how beneficial it can be to take five to minutes each day to simply to sit and breathe deeply, not only for the sake of our individual physical and mental health but also for our ability to have positive interactions with others. Although it took a bit of time for families to make their way over from the complex, about an hour into the event, the park was bursting with energy. The kids, ranging from age 2 to 12, spent most of the time in groups playing the various games, eating the treats that were provided, and a few tried out the crafts, while the adults enjoyed the refreshments and talked among themselves. The big event that brought everyone together was the tug-of-war game. Both kids and adults participated and it was evident a lot of fun was had based on the many smiling faces and bursts of laughter. More than 15 newcomer families came out, some from the surrounding houses. There 5 long-time Canadian families that came to the park and they shook hands with the newcomers, chatted through interpreters about the neighbourhood and family life, and took part in some of the games. The tug-of-war game did give these groups of people something to bond over and although overall we think the people who did come enjoyed themselves and were able to strengthen relationships with one another, we know that it takes time and intention to break through the barriers of culture and language. We are confident that the conversations we had in our four visits to the neighoburhood and the gathering itself have already added that intentionality to future interactions in the neighbourhood. This week, the Festival of Neighbourhoods summer team took to Greenfield Park for an exciting new opportunity. The team experienced their first Instant Blitz of the season! An Instant Blitz maintains all of the fun steps of an original Blitz by exploring a neighbourhood, getting to know the neighbours, and going door to door to extend invitations to a neighbourhood gathering. An Instant Blitz only emphasizes its spontaneous nature by condensing the process into a few hours instead of a few days! In the spur of the moment, the team members demonstrated the simplicity of making connections and that neighbourliness can happen anytime anywhere! Greenfield Park area is surrounded with a number of townhouse blocks close to Fairview Park Mall. Some are condominiums, some are rental and some are Community Housing. Greenfield is home to many different families from retirees, young couples, newcomer families to post-secondary students. This was a perfect chance for our team to spark conversations with neighbours to find out what connections already exist and which they would like to build. The team set up the gathering mid-morning in the beautifully maintained green space and playground nestled Greenfield Park. These activities were centred around “making your mark” on the neighbourhood. Origami crafts such as paper hearts and fish were meant as tokens to be placed in and around the neighbourhood. While refreshments and activities were set up, the door to door team explored the area and began greeting people on the streets, at bus stops, on their front steps. We were pleasantly surprised at the amount of activity there was in the community given the time of day! Our team visited nearly more than 50 homes, sparking up conversations of what neighbours liked about their neighbourhood. Some told us that they loved the quietness and how their immediate neighbours look after one another. Some experienced life in the neighbourhood differently. Maybe they lived in their home for a number of years and do not know many of their neighbours. Some parts of the neighbourhood are not as quiet with loud music playing or late night gatherings. 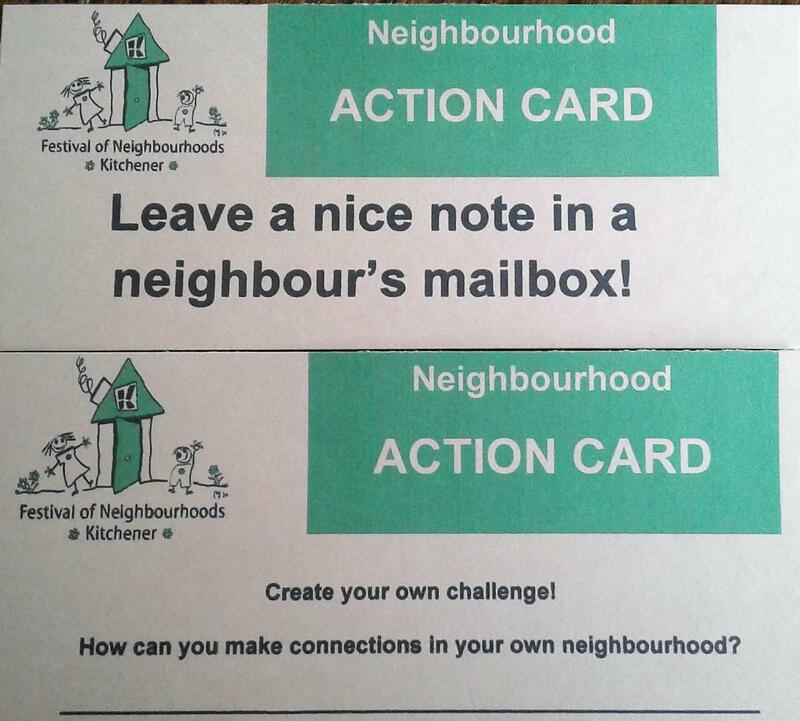 When sprinkled our Neighbourhood Action Cards around, with simple suggestions how to engage with their neighbours, most people took them enthusiastically and were excited at the challenge of connecting with each other. Like the paper crafts made at the park, our team left Neighbourhood Action Cards in doorways and windows around the neighbourhood to spark conversation and connections. Back at the playground, young children and caregivers enjoyed the games. Neighbours walking their dogs stopped and said hello, people waved and smiled. We all shared our fondness over the common green space and agreed on the exciting potential that a park like this brings to a community as we learned about the high turnover which has become a challenge to maintaining relationships. We do not know if new friendships will be built. We can only hope that people from different corners would start conversations in the park, on the bus stop or in front of their townhouses. Maybe, some would approach their next door neighbours more often. Maybe, there will be more conversations about the Festival of Neighbourhoods around dinner tables. We might hear about it soon. The Festival of Neighbourhood (FON) team, volunteers, and summer placement students go out every summer to explore new parts of the city with hopes to spark conversations and bring neighbours together. This year, our first blitz was bringing together neighbours from Prospect Avenue, Trafalgar Avenue, Wilfred Avenue and Broadview Crescent. We wanted to create an opportunity for neighbours to see how simple it can be to come together and encourage them to try it more often. Prospect Park neighbourhood is a very diverse community. There are still some original homeowners who settled in the 1970’s and young couples who have recently joined the neighbourhood. There are neighbours who raised their children or grew up in the very area, and recently immigrated families. Many people working on home improvements and their beautiful gardens demonstrates the pride people have for their homes. We met many retirees during our morning door knocking, and many working people during our evening visits. Overall, we invited 100 houses and apartments to a Neighbourhood Gathering held the following evening. The word about the gathering spread quickly among neighbours and we felt huge encouragement as neighbours started asking us questions about FON. By the time of the gathering began, the weather stayed absolutely beautiful and allowed for a great turnout. When we arrived to set up for the evening, we spotted a few families already hanging around the playgrounds. We brought coffee and tea, children spotted tasty freezies, and neighbours quickly dropped by for introductions and conversation. Our summer students giggled as they learned how to play jump rope with little ones around the playground. Older neighbours shared stories and memories. Neighbours in retirement and young families who were fairly new to the area finally had a chance to meet and put names to friendly faces. Everyone cheered as we learned that one couple has been a part of the neighbourhood for over 44 years! Neighbours told us what they liked best about their neighbourhood. With written quotes such as “we stayed because we have the best neighbours”, “established, quiet, well kept”, and “neighbours take care of each other” blowing gently in the breeze, a delightful environment was created for reminiscing and storytelling. Neighbours swapped stories about the changes they had witnessed in the neighbourhood over the years. New neighbours were pleasantly surprised to learn that the park used to have a creek running through it! Neighbours bonded over a shared pride for the beautiful landscape, mature trees, and love for the park. Some neighbours began trading secrets and advice on gardening and outdoor recreation. Others shared their concerns regarding an old educational institution going up for sale and took guesses as to what the new property owner would do with the land. Young mothers invited one another on future play dates. Even the four-legged neighbours had a chance to share the fun! With so many dogs in the neighbourhood, we tended to a dog zone for pooches to stop by and have a drink. This was a great new addition to our neighbourhood blitzes. As the conversations expanded, so did the crowd. 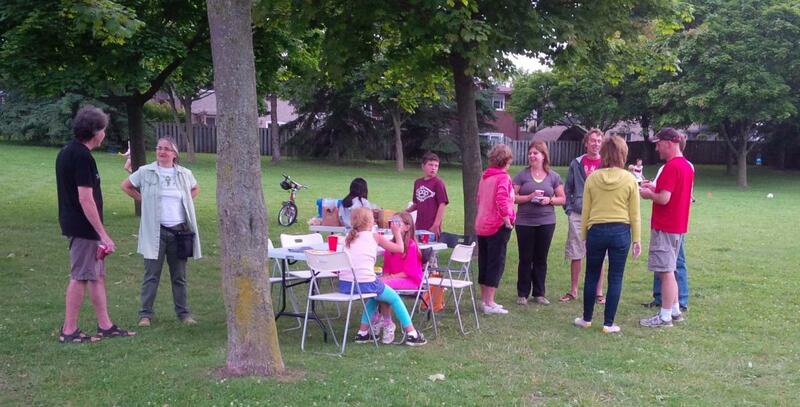 At the height of the evening, we had over 40 neighbours visit the park to unwind and get to know one another! A few newcomer families made their way to our group. Adults relied on the younger generation to translate and make introductions as neighbours greeted them. A game of ladder golf was a new game for everyone and we shared laughs, regardless of our mother tongue, while partnering up and learning how to make a perfect ball toss. As much as there were opportunities for a mix of neighbours to bond over similarities, they learned about their differences as well. Coming together for the first time, it was possible to show good will and lay down the foundation for stronger connections in the future. There is enthusiasm in having another gathering very soon. Hope we get invited! The FON team, along with our summer volunteer staff, excitedly set out for our second Blitz of the summer in the Hoffman Area of Kitchener. This was a particularly thrilling opportunity for FON, because the interest for a Blitz was initiated by a resident (otherwise known to FON as a neighbourhood champion!) The neighbour had shown interest in the work of FON and wanted to see if life could be sparked in their own community. The boundaries of the particular neighbourhood consisted of Highland Road, Hoffman Street, and Southdale Avenue. A map was outlined by the neighbour that included social housing, apartments, triplexes, and bungalows. With our invitations extending to around 200 homes, we met neighbours of all different ethnic and economic backgrounds. We had the opportunity to meet many newcomer families, shift workers, and retirees. During a sunny day of neighbourhood exploration, we noticed existing resources that the neighbourhood already had. We met a neighbour who explained to us that he had participated in a Little Library workshop and built a Little Library on Southdale Avenue. We visited a beautiful playground and green space, that was created through a resident leadership, nested behind the school that provides a shady place for dog walkers and young children to enjoy their evenings. We met a supportive building superintendent who maintains tenant connections in addition to the upkeep of the property. If only the nice weather continued on for our door-to-door! We unfortunately experienced a thunderstorm as we started going door-to-door to hand out invitations for the get together. Many flyers were tucked into dripping wet mailboxes with fingers crossed that our gathering the next day would have better weather. However, while hiding from the rain, we had a chance to have long conversations with a few neighbours in hallways of their buildings. We learned that as they might know the neighbours in their buildings, they did not spend much time with people from other buildings. One neighbour admitted, that putting a chair in front and sitting outside would be a lonesome act of neighbourliness. The following day the team set out for the green space in front of Queen Elizabeth Public School for our neighbourhood gathering. The evening began with some sun and a couple of neighbours from the south western Hoffman apartments quickly gathered. An older woman we had met the evening before brought her neighbour, while a few others joined us out of curiosity. These neighbours were friendly and chatty. Neighbours bonded over similar experiences and reflected on resilience with humour. A few children passed by and happily realized that we had freezies. As the word was spread around the neighbourhood to siblings and friends, eventually over a dozen children came to enjoy games of ladder golf and horseshoes. A woman with extraordinary experience of being a neighbourhood champion came out to share ideas on how the neighbourhood could become more lively and hoped that younger people would take on future projects. We spotted many neighbours out and about, but there seemed to be some hesitation in approaching our group. Our team members decided to reach out and invite everyone playing in the park behind the school, walking their dogs, or enjoying time on their porches. It was clear that there was a bit of a disconnect between households on Highland and Hoffman sides. Neighbours asked themselves how those connections can be created? How the divide came to be? Some of the insights revolved around high turnover, immigration and linguistic diversity, age and lifestyle differences, and long working hours. We can ask ourselves what we appreciate about our neighborhoods, how can we be more in tune with the people around us, and ultimately, what we value and how do we make sure we have abundance of valuable experiences where we live. Neighbours of Hoffman Area who came out agreed that connections are valuable and that there is certainly hope for being more connected in the future. Just as the neighbourhood was opening up, so did the clouds. Rain began to fall and the children squealed through the hilarity of hurrying home to keep dry. Thunder and lightening drove us to having to pack up for the evening. Neighbours did not want to end the party and hoped we would come back soon. A few conversations went on despite the rain! The elements should never stop one from meeting a new neighbour! During our Summer outreach in 2013, Festival of Neighbourhoods was invited to support a generous and eager neighbour who dreamt of having the families on Prosperity drive come together as a community. She imagined a world where neighbours would walk and talk together, gather in the nearby Foxglove Park, play guitar at the corners of the street, host barbeques and potlucks, and invite everyone to get to know and share life with one another. With the help of a few friends, she organized a garage sale for a whole day in her front yard. The day started with fresh coffee and muffins early on a Saturday morning, fun games to play with on the grassy areas between the neighbours’ houses, and a multitude of people coming together to sell and buy things. The festivities continued throughout the day with a barbeque lunch in her back yard. Towards the end of the afternoon a guitar had been brought in, and more neighbours came by to stop and talk to each other. She hoped that the same spirit would continue, and that her neighbours would contribute and come together afterwards. The Festival of Neighbourhoods team joined Prosperity Drive in 2013, bringing games from the Neighbourhood Activity Trunk with us. We skipped and played with the neighbours, spoke to each other in different languages, and spent sometime on our feet and sometime sitting in chairs. People were glad to learn about the Festival and we made sure that more activities would follow. We hadn’t heard from Prosperity drive again until 2014, and the next Neighbourhood Garage Sale. After the Garage Sale however, there were no other activities for another year. In 2015, there was no garage sale on Prosperity Drive at all. By 2016, our Festival outreach team joined a community fair in a neighbourhood close to Prosperity drive and Foxglove park. As we chatted with some of the participants, they told us they lived on Prosperity drive and Foxglove street. They shared with us a familiar dream of wanting to see neighbourhood barbeques and street parties. The only thing holding them back was that they felt they were alone in their yearning for neighbours that were active members in each other’s lives. In conversation, we learned that some found an outlet by volunteering at a nearby school where many children from the Prosperity/Foxglove area were attending. There was a connection! It was clear that we could draw from the connections made outside of the immediate area through the school and bring them back to the neighbourhood. Two of the neighbours were thrilled to learn about our blitzes that we do through Festival of Neighbourhoods outreach and wanted to see one organized around the Foxglove Park. That Spring we worked with students from the School of Public Health and Health Systems at the University of Waterloo. After handing out flyers to neighbours and taking special efforts to invite families with children, 10 to 15 people were expected. However, around 40 neighbours gathered at Foxglove Park on March 26th for a Festival of Neighbourhoods supported Easter egg hunt. The student organizers had excellent ideas for an extravagant Easter Egg Hunt which would bring all the neighbours together at the end of the hunt, to open their eggs, and to celebrate their communion. Bunny ears and hats were made on site and worn by eager participants as they ran and searched for over a hundred sweet treats hidden all around their park. A piece of a puzzle was inserted in some of the 200 eggs we prepared and everyone came together to fit the puzzle pieces at the end of the Egg Hunt. After, there was a very muddy, but fun three legged race, and an Easter puzzle to be put together with pieces found in the hidden eggs. There was hot coffee, hot chocolate and delicious cookies so parents and caregivers had a hot drink and a chance to get to know one another. It was easy to plan and simple to do, but the results were worth so much. Neighbours connecting, sharing, showing support for their community, and having fun together! The success of this first event in Prosperity neighbourhood has encouraged neighbours to think about other events to share experiences and make their neighbourhood a better place to live. By registering their event with Festival of Neighbourhoods, Foxglove’s Easter Egg activity will now be entered into a draw for a chance to win a $20,000 Neighbourhood Improvement Grant. Why not let Festival of Neighbourhoods support you and your neighbours to hold an event? Bring your Neighbours together and let’s have fun! “There were trees ripped from the ground when the hurricane passed six years ago…”, “It all used to be a part of an old farm…”, “People were flowing to a neighbour’s house every Friday and joining annual music back yard parties…”, “A neighbour called by a name that was not his for 20 years and did not mind…”, “When I moved in, I invited everyone for a Christmas party. We are getting together ever since!”. The stories and laughter were echoing at the Doon neighbourhood, that we call Millwood Area. It is a smaller and now a familiar group of homes on the north side of Millwood Park: Millwood Crescent, Harcourt Crescent and Windy Ridge Drive. The Festival of Neighbourhoods outreach team brought the neighbours out to the Tea Party in the Park. We did door to door and learned a lot about this 35 year old neighbourhood. There are quite a few families that moved in when the houses were first built. They seem to have a special generational bond. At the same time, it felt good seeing 35 year settled neighbours talk to those who moved in only 2 months ago. People coming to the neighbourhood nowadays choose it for the same reasons the first inhabitants did: quiet, green, family-friendly, close to schools and well groomed. The nicely landscaped front yards tell that people are there to stay and settle. It is clear to everyone that despite new families coming to the neighbourhood in the last years, it is still at a different pace than in some other Kitchener neighbourhoods with constant changes of house owners and renters. Neighbours like it that way. At times, the crowd loving families that were bringing people together move away. The neighbourhood still remembers fireworks in the park, block parties and garage sales that happened more frequently years ago. What makes these neighbours stay connected? There are many dog owners and neighbours have been bonding over dogs. Many have told us that we are in one of those places where everyone says “Hi” and would stop by to chat. When you move, you just greet your first door neighbours and they offer their help in settling down. Or you do what some did when they moved in – throw a party and invite all the houses on your street! Those who came out to the Tea Party in the Park say that getting neighbours together is a great thing and that it should happen more often. The kids were excited. They were calling friends and relatives to come out. Dinner could wait until tomorrow! Close to the sunset, when we were finally saying good-bye, we were asked when we would come again. The answer was “When you invite us to your Tea Party!”, because we know the parties in Millwood will go on! The Festival of Neighbourhoods Thursday in the Park in Moorate/Markwood happened in two waves. Our team was in the park besides A.R. Kafuman to set up at 6:30 and just a few neighbours came out and stayed until later. It was so cold. Two brothers who joined for a game of coquet, took a guess at the number of jellybeans hoping to wing a full jar, but couldn’t wait until the contest ended! A neighbour came out with her kids, but she did not even take them out of the car and left after one cup of coffee. A few more boys came out for clementines and cookies. Their parents followed them but stayed just for a short while to satisfy their curiosity to find out who we were. Thanks to the scoops and balls game our team did not freeze. Make a note. An amazing couple of people stayed with us, kept the conversation about the neighbourhood going as long as their kids could keep playing. “Know you neighbours” contest produced some lively debate. Most people did not know about a couple on Moorgate who invites everyone on their side of the street for an annual BBQ. Opinions were divided about the turnover in the neighbourhood and if it could be considered high or low. The women who won the contest left with the promise to bring more neighbourhood initiatives together. An hour later, when the prizes were given out, we started exchanging looks, debating whether to leave ourselves, a sudden stream of people started joining us. A man saw us over his backyard fences and decided to come over. Families went out for a late walk and headed towards the table with Tim’s coffee and tea. Sometimes we shared the same mother tongues and sometimes we got by with English – but it suddenly got much warmer on the little hill over the park. There was movement, there was talking and there was play. We learned that many families get together daily for picnics and evenings in the park. A girl refers to this group familiar to her as “women with hijabs” and makes a circle around her face with her hand. They are so connected and make calls to check on the weather and kids’ sleep overs all the time. She would never move from this neighbourhood. It is so now, when the fussier kids that made others do bad things are gone. The parks are the best, and when one is full, people just move to the other across the street. Sometimes you cannot pass through the park how many kids there are playing volleyball, soccer, baseball, basketball… Some of the neighbourhs are connected to the neighbourhood association. One says he wants to shut the entire street down for a neighbourhood BBQ! Everyone knows about the community centre. So many good programs at such an affordable price. Cannot wait for the fall for the centre to open up again with all the programs. Children living further down in Belmont Village come to A.R. Kaufman park to play every day because kids don’t hang out over there as much and the parks are not big enough. A small circle of friends from Downtown Kitchener, shyly joined us, wanting to hear more about who we are, and what we are celebrating. They ask if we can visit their neighbourhood as well. The night is still cold and the wind biting, but there is plenty of chatter and laughter in the air. We started playing ladder gold in teams, and laugh so much when we miss because our hands and arms are almost stiff in the wind. But the game goes on. Get in touch with us and we will come to your neighbourhood next spring or summer! On Tuesday, August 19th, the Festival of Neighbourhoods outreach team, Aleksandra Petrovic, Musa Ndlovu, Barbara McGrath and Ruth Williams, invited the community to celebrate ‘Tuesday in the Park’ at Westchester Park. As we were preparing in the park for the night festivities, it brought back memories of days-gone-by. Do you remember when - peering out the window - looking for the hockey game on the street; or, children’s gathering around the telephone-poll for hide-and-seek was the sign that the nightly entertainment of fun and festivities was about to begin? Rushing to get your chores done so you could go out and play! ‘Tuesday in the Park’ began with the same exuberance. Many children in the neighbor were excited to join in the night’s festival enjoying the swings, playing soccer and challenging each other in various games. Seeing an opportunity, one girl ran home and returned with her face painting kit transforming children’s faces into mythical creatures requested by the children. As the adults began to come to the park for a cup of tea and coffee, neighbours began to stand in a circle and share stories of the last year’s event. Neighbours organized a picnic and a celebration after the new park equipment has been installed in their park. The ‘Festival of Neighbourhoods’ team outreach timing was impeccable in the Westchester community, as the citizen were ready for their second attempt this September to have a ‘picnic in the park’ together. They were delighted to hear about the Festival supports as the neighbours were encouraged to join the planning committee and shared the various links to different activities and ‘The Mayor’s Challenge’. This past Monday, members of the community, held their first meeting of the year to plan for the upcoming ‘Picnic in the Park’. Bringing the neighbours together for the chit-chat is in itself a success, and I look forward to the stories and laughter that will be created in the journey in designing the next ‘Picnic in the Park’. The Festival of Neighbourhoods team, strengthened with our Summer interns, goes out every Summer and enjoys visiting new parts of the city and starting conversations about neighbourhood engagement. 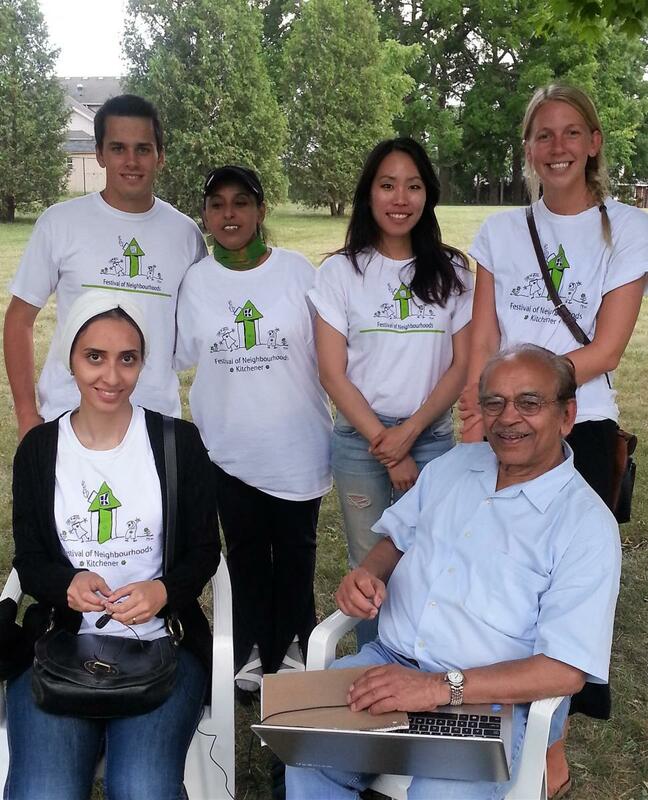 The team did its first door-to-door blitz at the Vanier Drive and Traynor Avenue area in order to invite people to a neighbourhood gathering at Traynor Park. Vanier and Traynor Drive is a largely immigrant populated, lower income area, with mostly rental apartment buildings and some owned condos. Though there are many who have lived in this neighbourhood for almost a decade or more and it is their home, this neighbourhood is a passing place for many. The closest community centre with recreation facilities and a large diversity of programs is Kingsdale Community Centre which is not walking distance. We chose Traynor Park for the get together place for the convenience and access, and because it is a natural gathering place for children and teens. 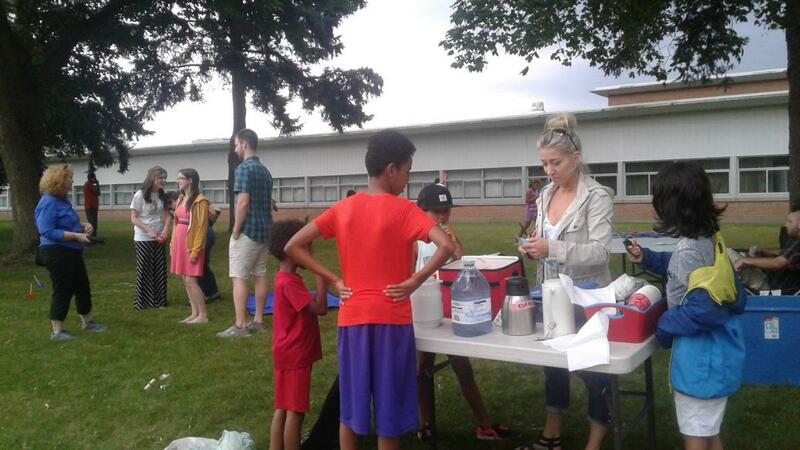 All 350 households in the neighbourhood were invited to the Picnic in the Park. We either talked to them at their doors or left invitations at the doorsteps. The most interested were immigrant families and mothers with young children. The women were surprised that there was an event taking place in their neighbourhood, which seems to point out how isolated the neighbourhood is from most of the programs. The door-to-door was very intense, hearing about the living conditions and lack of safety, and on the other hand hearing about how it is essential that all the basic amenities were close by and how families brought up their children there and stayed for the friends. We had a truly amazing evening in the park with the children and youth. The community spirit shared in the Tarynor Park is built for the ages 16 and under! Play was a way of bonding, shaping relationships and growing up in a world, that is not always the most gentle place. The children joined us in a soccer game, scavenger hunt, tug of war and loved munching freezies as a prize. Women with young children that came out found it very easy to bond over their new Canadian experience, raising children in a different culture and trying to get by in a new environment. Some of the women had met at an ESL course during night school and lamented over difficulties faced by many newcomers, like finding inexpensive childcare, finding jobs, or going back to school fulltime. The event was also an opportunity for some residents to tell us what they thought about the initiatives such as the Festival of Neighborhoods and the role it could play in diverse and low income neighbourhoods. During the door-to-door there were honest residents who said they would not come, the reason being Festival of Neighbourhoods is not being seen as a part of the solution in the light of challenges that this community faces. On the other hand, we had the greatest pleasure meeting some of the most engaged community builders in this area who have been contributing to the improvements of the parks and palygrounds over more than a decade! Amazing humble, honest and generous people that know all the glows and lows of the neighbourhood, daily being there for their neighbours. We have met people that are willing to share their vision of what the neighbourhood can be and we are sure we will get invited to the next get together in Traynor Park. Only, this time hosted by the amazing people from the neighbourhood! The second Festival of neighbourhoods blitz was held at Heritage Park. 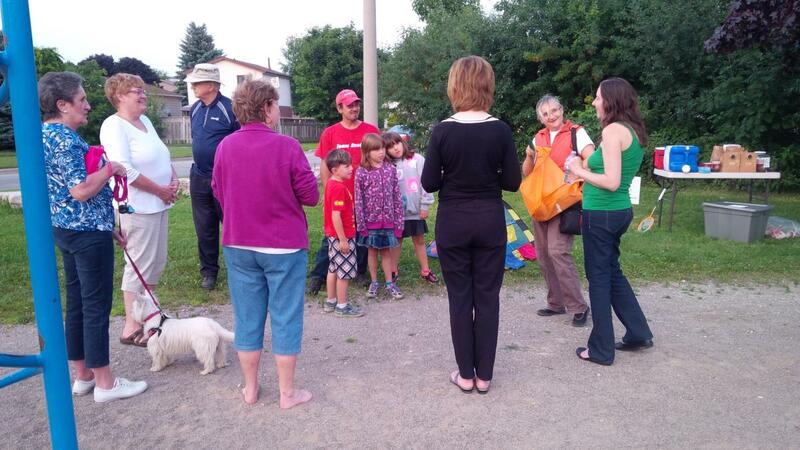 The Festival outreach team went door-to-door inviting all of the neighbours out for an evening in the Park. Not even the rain could stop the doing door-to-doors. Many neighbours have lived in the area for 35 years and longer! Families enjoy living so close to schools, recreation facilities and the beautiful green spaces. Many residents are in their golden years and enjoying the calm now that the children and grandchildren have moved on. We learned that some of those children are coming back, buying houses near to the park to raise their own families in the same place they grew up. The Day in the Park event was during a beautiful, sunny afternoon at Heritage Park. Though the number of children was less than the FON team had expected, there was a lot of good conversation with adults. The team played a lot of games, badminton being a favorite for the evening, and enjoyed talking to residents who showed up just to meet their neighbours! We spoke to women that have lived in the neighbourhood for more than 30 years, before the high rise was built and when the park was a wide flat field. They love the area, so quite, serene, and calm. They know a lot of neighbours, volunteer in the school across the street, brought up many grandchildren and had the memorable play days in the park with picnics, theater performances, concerts and shows in the shade and at the play structures and in the bushes around the park. One of them told us that she makes it a point to come out to all neighbourhood gatherings and activities for the many decades she has lived in the neighbourhood. However, the older generation would not call the neighbourhood close knit in the sense where the old time residents visit each other at their homes, have coffee in the gardens, or interfere in each other's daily routines. These particular relationships that preserve everybody's privacy were appreciated and they would not have it any other way. We asked them if they remembered any street parties in the neighbourhoods, and they didn't seem to recall neighbours organizing activities together. They themselves tried with an occasional garage sale, but few people would join. “…the court has openly embraced our family with open arms and exclaimed that we could never buy a house in a neighbourhood as good as this. This was so reassuring and welcoming for us as we have 2 small children and that was a huge priority for my husband and I. Their annual Father's Day court party was a neighbourhood celebration like no other that we've ever seen. They had one couple from the court set up their band and sing throughout the day. When we were new to the neighbourhood, a member of the band personally welcomed each of our family members on the mike for all to hear. What a sense of community! There are some young parents, brought up in the neighbourhood, then moved away for studies and work. Once having their own families, the most natural place to bring up the children was going back to the comfort of memories, familiarity, and acceptance that they had in their childhood. And we heard a lot about how unique the neighbourhood is. It offers access to all the basic amenities, from schools and stores, to the swimming pool and to the hockey and skating arena. There is wonderful greenness of bushes and paths for dogs to enjoy in their people's company, and there are walking paths, little creek and woods that offer excitement in all seasons, from rabbits, to coyotes and even deer. That evening, we meet the two worlds nested in the same neighbourhood, connecting past and present, and working together to create a sense of connection and care in their neighbourhood.